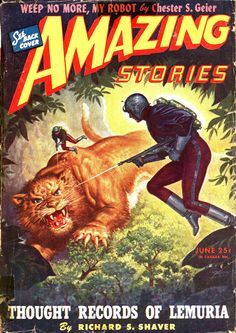 Become scholar adventures by digging into the archives and bringing to light the mysteries contained in science-fiction pulp magazines from the 1920s on! Record and share your findings and become part of a conversation that posits that science fiction is a meaningful genre for all people. We will start our journey by studying the history of science fiction, with special attention paid to how the genre is influences by historical events and plays an active role in influencing society. We will look at who creates science fiction and why minorities have historically felt unwelcome in this genre. The genius and influence of white male SF authors such as Isaac Asimov, Ray Bradbury, and Phillip K. is well know. However, it is worthwhile to look beyond these strong voices to discover what minorities can and have added to the conversation. Finally, we will start to build a never-before-that will record writers of science-fiction pulps, who they were, and what they contributed. The hope is that we will find solid proof that minorities had as much of a hand in the history of science-fiction as the white male writers that seem to dominate the field. This is never-before-attempted research—a chance to make an original contribution to an emerging field. There is a chance you will push against science-fiction as literature. I get it. A lot of the stories in the pulps are really just awful. However, keep in mind that awful literature teaches us as much about ourselves as great literature. And science fiction can be great. Trust me to guide us to important, mind-bending, soul exploring literature. The below assignments will be detailed in full in the CONTENT section of ELC—the below is just to whet your appetite. Our first goal in this class is to identify what outside factors a text is reacting to and explain how that reaction is coded in literature. Project One and Two will help us with this goal. · Project One (15%): Write a review of one issue of any pulp. This review should be 1,000 words, include graphics, and be written in an informal tone. · Project Two (15%): A close-reading of any story from a pulp. This reading needs to be 1,000 words, consider the outside factors that influenced its construction, use textual evidence, and be written in a formal tone. Our second goal is to understand that lost/unacknowledged writers with diverse backgrounds and ethnic makeups can use science fiction to express something new, important, and different. Projects Three and Four will help us with this goal. · Project Three (20%): Student will be placed in groups of three and each group will be assigned a school of science fiction. Each group needs to construct a visual and oral presentation exploring their assigned school. After presenting to the class, the groups will need to revise their presentation for inclusion on the web. Due Dates Vary. · Project Four (25%): Each student will choose an author and trace that author’s career, finding patterns of thought, practices, and imagery. This research will then be turned into a written narrative. Our final goal is to re-frame conventional though on science fiction, proving that it is not a lesser genre only for white males, but an inclusive literature that has much to contribute to an understanding of the human condition. · Project Five (25%): Students will be placed in groups and given a specific pulp title. They are responsible for documenting the authors and stories for each issue of the pulp, transferring that info to the website, and building the web page for that pulp.